(a) Suggest or advise the employment of, or name for employment, any particular attorney to represent his or her principal. (b) Directly or indirectly solicit business in or on the property or grounds of a jail, prison, or other place where prisoners are confined or in or on the property or grounds of any court. The term “solicitation” includes the distribution of business cards, print advertising, or other written or oral information directed to prisoners or potential indemnitors, unless a request is initiated by the prisoner or a potential indemnitor. Permissible print advertising in the jail is strictly limited to a listing in a telephone directory and the posting of the bail bond agent’s or agency’s name, address, and telephone number in a designated location within the jail. (c) Initiate in-person or telephone solicitation after 9:00 p.m. or before 8:00 a.m., in the case of domestic violence cases, at the residence of the detainee or the detainee’s family. Any solicitation not prohibited by this chapter must comply with the telephone solicitation requirements in ss. 501.059(2) and (4), 501.613, and 501.616(6). (d) Wear or display any identification other than the department issued or approved license or approved department identification, which includes a citation of the licensee’s arrest powers, in or on the property or grounds of a jail, prison, or other place where prisoners are confined or in or on the property or grounds of any court. (e) Pay a fee or rebate or give or promise anything of value to a jailer, police officer, peace officer, or committing trial court judge or any other person who has power to arrest or to hold in custody or to any public official or public employee in order to secure a settlement, compromise, remission, or reduction of the amount of any bail bond or es-treatment thereof. (f) Pay a fee or rebate or give anything of value to an attorney in a bail bond matter, except in defense of any action on a bond. (g) Pay a fee or rebate or give or promise anything of value to the principal or anyone in his or her behalf. (h) Participate in the capacity of an attorney at a trial or hearing of one on whose bond he or she is surety. (i) Loiter in or about a jail, courthouse, or where prisoners are confined. (j) Accept anything of value from a principal for providing a bail bond except the premium and transfer fee authorized by the office, except that the bail bond agent may accept collateral security or other indemnity from the principal or another person in accordance with the provisions of s. 648.442, together with documentary stamp taxes, if applicable. No fees, expenses, or charges of any kind shall be permitted to be deducted from the collateral held or any return premium due, except as authorized by this chapter or rule of the department or commission. A bail bond agent may, upon written agreement with another party, receive a fee or compensation for returning to custody an individual who has fled the jurisdiction of the court or caused the forfeiture of a bond. (k) Write more than one power of attorney per charge on a bond, except in the case of a cosurety, unless the power of attorney prohibits a cosurety. (l) Execute a bond in this state on his or her own behalf. (m) Execute a bond in this state if a judgment has been entered on a bond executed by the bail bond agent, which has remained unpaid for 35 days, unless the full amount of the judgment is deposited with the clerk in accordance with s. 903.27(5). (n) Make a statement or representation to a court, unless such statement or representation is under oath. Such statement or representation may not be false, misleading, or deceptive. (o) Attempt to collect, through threat or coercion, amounts due for the payment of any indebtedness related to the issuance of a bail bond in violation of s. 559.72. (p) Conduct bail bond business with any person, other than the defendant, on the grounds of the jail or courthouse for the purpose of executing a bond. (a) Jailers or persons employed in any jail. (b) Police officers or employees of any police department or law enforcement agency. (c) Committing trial court judges, employees of a court, or employees of the clerk of any court. (d) Sheriffs and deputy sheriffs or employees of any sheriff’s department. (f) Persons having the power to arrest or persons who have authority over or control of federal, state, county, or municipal prisoners. A bail bond agent may not sign or countersign in blank any bond, give a power of attorney to, or otherwise authorize, anyone to countersign his or her name to bonds unless the person so authorized is a licensed and appointed bail bond agent directly employed by the bail bond agent giving such power of attorney. A place of business, including a branch office, may not be established, opened, or maintained unless it is under the active full-time charge of a licensed and appointed bail bond agent. Except as between licensed and appointed bail bond agents, a bail bond agent may not divide with others, or share in, any commissions payable on account of any bail bond. 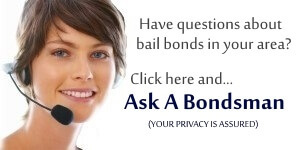 (a) No bail bond agency shall advertise as or hold itself out to be a bail bond or surety company. (b) Any misleading or false advertisement or deceptive trade practice is prohibited as provided in part IX of chapter 626. (c) The advertisement of reduced premium rates is prohibited. (d) After October 1, 2002, a bail bond agency may not use a name that implies a reduced rate of premium. A bail bond agent may not make material misrepresentations or omissions in statements or use advertisements that constitute material misrepresentations of facts, create unjust expectations concerning us, or make improper comparisons. Bail bond agents may not own or advertise under firm names that are false, misleading, or deceptive, or use trade names that imply a connection with any government agency. A bail bond agent may not use any advertisement or advertise under any name that includes the word “free”. A bail bond agent may not advertise under a trade name unless the name and address appear on the agent’s letterhead or business cards. Such name must be registered with the department. Any permissible advertising by a bail bond agent or agency must include the address of record filed with the department. (a) A person who has been convicted of or who has pleaded guilty or no contest to a felony or a crime involving moral turpitude or a crime punishable by imprisonment of 1 year or more under the law of any state, territory, or country, regardless of whether adjudication of guilt was withheld, may not act in any capacity for a bail bond agency or participate as a director, officer, manager, agent, contractor, or employee of any bail bond agency or office thereof or exercise direct or indirect control in any manner in such agency or office or own shares in any closely held corporation which has any interest in any bail bond business. Such restrictions on engaging in the bail bond business shall continue to apply during a pending appeal. (b) Any person who violates the provisions of paragraph (a) or any person who knowingly permits a person who has been convicted of or who has pleaded guilty or no contest to a crime as described in paragraph (a) to engage in the bail bond business as prohibited in paragraph (a) commits a felony of the third degree, punishable as provided in s. 775.082, s. 775.083, or s. 775.084. (c) Any law enforcement agency, state attorney’s office, court clerk, or insurer that is aware that a bail bond agent or temporary bail bond agent has been convicted of or who has pleaded guilty or no contest to a crime as described in paragraph (a) shall notify the department of this fact. (d) Upon the filing of an information or indictment against a bail bond agent or temporary bail bond agent, the state attorney or clerk of the circuit court shall immediately furnish the department a certified copy of the information or indictment. (a) Any person who violates any provisions of paragraph (1) (e), paragraph (1) (f), paragraph (1) (g), paragraph (1) (j), or paragraph (1) (n), or subsection (2) commits a felony of the third degree, punishable as provided in s. 775.082, s. 775.083, or s. 775.084. (b) Any person who violates the provisions of paragraph (1)(a), paragraph (1)(b), paragraph (1)(c), paragraph (1)(h), paragraph (1)(k), paragraph (1)(m), paragraph (1)(o), paragraph (1)(p), subsection (3), subsection (4), or subsection (5) commits a misdemeanor of the first degree, punishable as provided in s. 775.082 or s. 775.083.